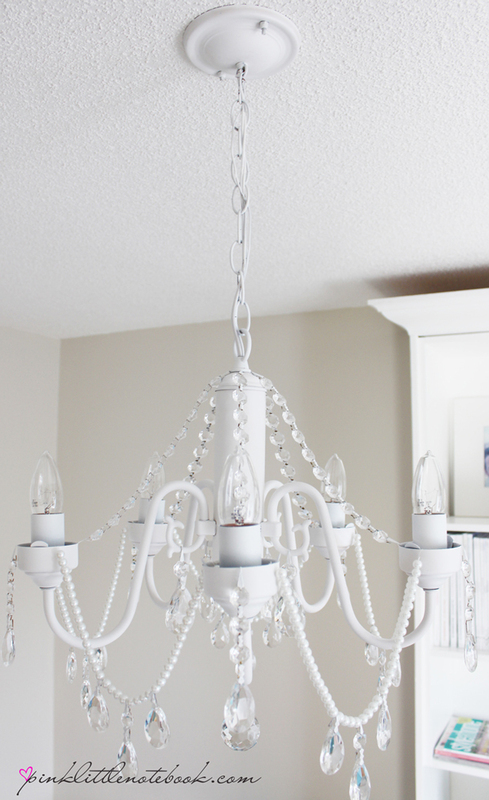 The DIY chandelier is complete and I love the profound statement it makes in my home office. As a continuation from my previous post, here is my before and after photo. I can’t stop staring at my new light fixture. It turned out exactly how I imagined. And the best part, it’s super easy to do! 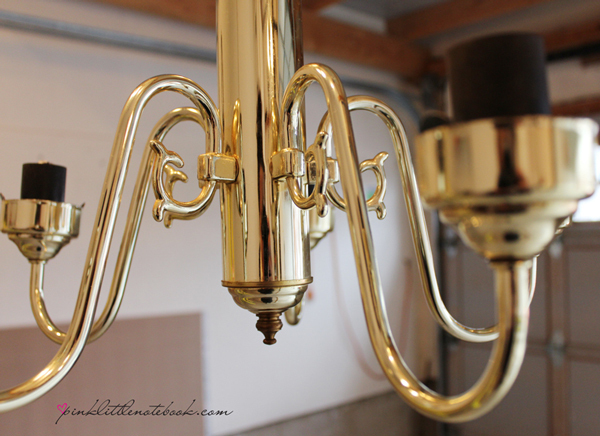 As soon as I got it home last week, I gave this thrift store chandelier a good cleaning (it took about a roll of paper towel to shined this up quite nicely). Then I hauled this thing over to my garage to start the painting. I taped the open end of the electrical wires and I stuffed newspaper in the light sockets to make sure the paint wouldn’t damage the connection. Then I went to town with some white spray paint. Make sure you use one of these holders. It makes spray painting a breeze! Then came the fun part. Time for some bling! I actually lucked out in this department. During a family dinner, I was talking about my chandelier project. 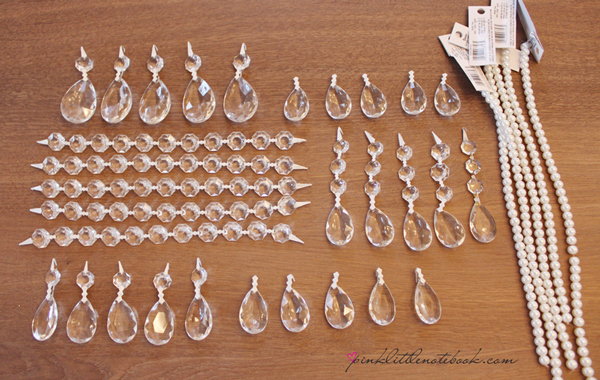 My (soon to-be) father-in-law (aka “Big Joe”) surprised me with a brown paper bag full of glass crystals from an old chandelier he had stored away. SCORE! I was so excited! The only issue I had with the glass crystals was the brass colour of the connectors and hooks. I bought a white paint pen to correct the issue. I also went out and bought some glass pearls from Michaels. And there we have it, my very own DIY chandelier. This is so beautiful!! I want this in my room! Thank you so much for the amazing tutorial, can’t wait to try it!! Oh, is that a beauty! Great job! I see you have popcorn ceilings too, like us. How did you paint the ceiling? They are in every room of our house. I have a feeling the painters spray painted ours for the previous owner to put this house on the market in 2005. This house was built in 1977, all popcorn celings and no celing lights, so original owners must have used a lot of swag lamps and also had lots of hanging plants as there are many hanging hooks in each room. Cost is too much to have the ceilings scrapped off and too messy to deal with at our ages. No way to get in attic to install a ceiling light fixture. This is so smart! I love your transformation! 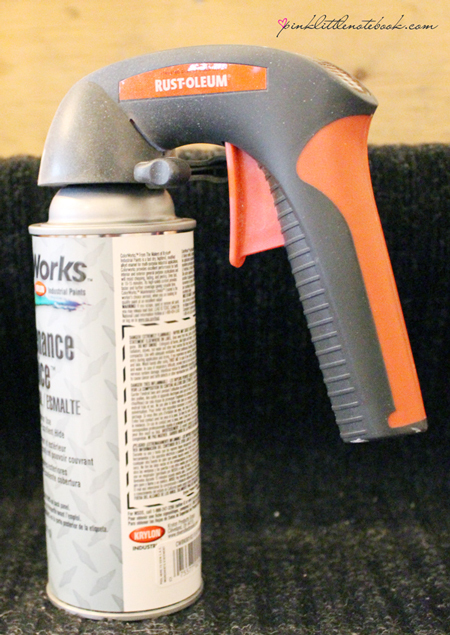 The spray paint attachment is such a great idea. Thanks for the advice! Awesome! I need to try this now. 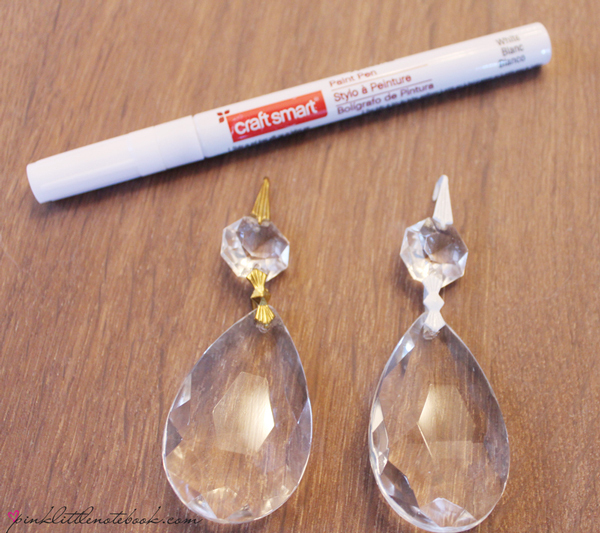 Such an awesome and cheaper way to get the look I want! WOW! Visiting from #ThrowbackThursdaylinkup and I am so impressed with your creativity. 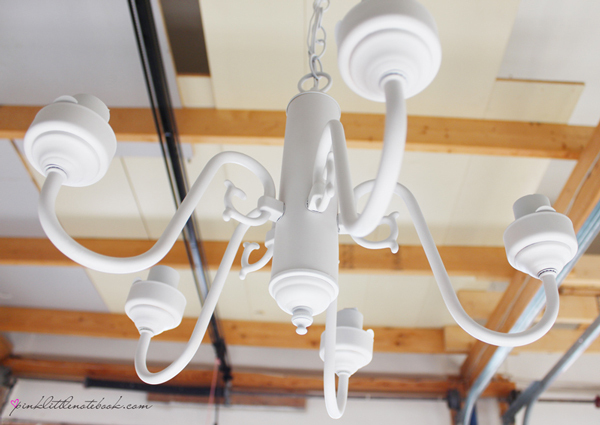 The chandy turned out awesome! LOVE THIS! I found you at #ThrowbackThursdayLinkup. I co-host The Wednesday Roundup. I hope you will share this there too! Its not too late! Great transformation! I love your idea of using a paint pen to cover the brass hooks. What a beautiful chandelier! I love it. I have a brass one in my dining room. I would love to do that! Thanks for linking up to #throwbackthursday link up! This looks lovely, I like how the white makes it more elegant! This turned out stunning! It looks so elegant and updated. Thank you for sharing this! Your chandelier is so beautiful, I bought my beads, my chandelier is ready and waiting and I now have some inspiration from you. Thanks a lot. Your chandelier is beautiful. What a difference paint makes. I love chandeliers with crystals and beads. 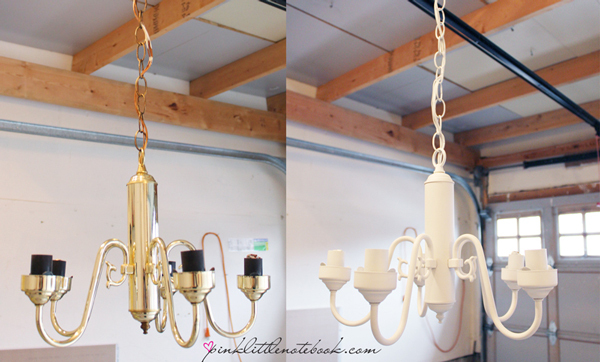 I have two fixtures that need a makeover. I definitely want to find some crystals for one that hangs over my dining table. I do not have anyplace to paint it inside so I am waiting for the warmer weather to arrive. Thank you for sharing your DIY. WOW….this is the ultimate. I love it and I want to do the same thing. 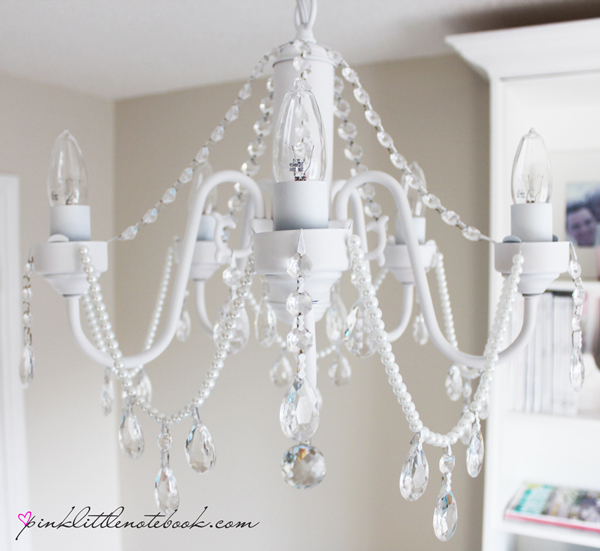 It is my hope to re-do a small chandelier like this for a powder room. I am going to save your information for when I am ready. Thank you so much. You are a magician ! ! ! !